Lori Gill is the founder and clinical director of the Attachment and Trauma Treatment Centre for Healing (ATTCH) www.attch.org. She is Certified Trauma Specialist (CTS), Consultant Supervisor, and Trainer, for the National Institute for Trauma and Loss in Children (TLC) and a former Psychology Professor with 16 years of clinical experience working with children, youth, and adults. Paul Frewen joined the departments of psychiatry and psychology at Western University in London, Ontario, Canada in 2008. He is currently chair of the Traumatic Stress Section of the Canadian Psychological Association (CPA). He received the President's Early Research Award from the CPA in 2010, Early Career Awards from the Traumatic Stress sections of the American and Canadian Psychological Associations in 2013 and 2014, and the Scientist-Practitioner Early Career Award from the CPA in 2014. He has authored over 70 peer-reviewed articles on the subjects of trauma, affect regulation, mindfulness, dissociation, and the self, primarily utilizing functional neuroimaging, experimental social cognition, and psychometrics approaches. He currently has a clinical psychology practice in London, Ontario where he primarily sees adults with PTSD, dissociative disorders, and/or chronic pain disorders and principally utilizes emotion-focused and mindfulness-based approaches to psychotherapy. Paul is co author of the book: Healing the Traumatized Self with Dr. Ruth Lanius and offers a wealth of knowledge. We are thrilled to have him presenting at our conference! Dr. Alkenbrack did her undergraduate and masters degrees at Queens University in Women and Gender's studies respectively. Following this she went to Michael G. DeGroote School of Medicine at McMaster University and then completed her residency training in Family Medicine at McMaster Family Practice in downtown Hamilton, working with under-serviced and impoverished populations. After completion of her residency, she completed a fellowship in Psychotherapy and Mental Health at Niagara Health with Dr. Darryl Wolski, focusing on mindfulness-based cognitive therapy and complex comorbid mental health populations. Her training and focus has been on how neurological and general medical conditions contribute to mental health presentations, as they are frequently missed or overlooked. She has special interests in neural compromise, including stroke and dementia. Sean Robb is a PhD candidate in neuropsychology at Brock University. He holds an internship Niagara Health System and works predominantly with individuals who are experiencing neural compromise and subsequent comorbid psychiatric symptoms as well as treatment resistant psychopathology. His work has focused primarily on those in poverty and who would not have access to neuropsychological services otherwise. In his research, Sean investigates the relationship between acquired brain injury and comorbid mood disorders, as well as arousal-based neurohabilitative techniques to aid these individuals. He has published in the fields of brain injury and psychiatry and has presented his research at both national and international conferences. Stephen J. Terrell, PsyD, SEP, is a Developmental Trauma Therapist practicing in Austin, Texas. He has fully integrated touch work into his practice. Steve is also certified in EMDR, has worked with first responders, and is trained in Trauma First Aid. He works with infants, children, teens, and adults, and is a frequent speaker at conferences and workshops on attachment-related issues, as well as the neurobiology of trauma. Carmen Richardson, MSW, RSW, RCAT, REAT is founder and director of Prairie Institute of Expressive Arts Therapy in Calgary, Alberta and offers training, consultation and supervision to professionals and community agencies. Carmen has trained play therapists, arts/expressive arts therapists, social workers, psychologists, and other helpers at various venues across Canada and the US. She brings 30 years experience to her full time private practice and is a registered clinical social worker, registered art therapist and registered expressive arts therapist. She has completed many trainings in body-oriented therapies, including Integrative Body Psychotherapy (IBP), Level 1 in Sensorimotor Psychotherapy for the Treatment of Trauma, and Inner Relationship Focusing. Carmen is also trained in E.M.D.R. and A.R.T. (Accelerated Resolution Therapy). Carmen is an Advanced Certified Trauma Practitioner and Certified Agency trainer with the National Institute for Trauma and Loss in Children where she teaches Trauma-Informed Expressive Arts Therapy for a variety of therapeutic agencies in the US. 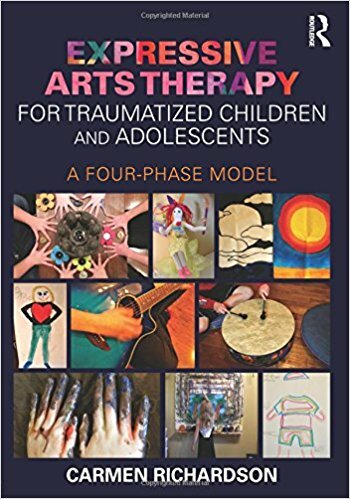 Carmen also teaches more intensive trauma trainings based on her book, “Expressive Arts Therapy for Traumatized Children and Adolescents”. Lisa Schwarz, M.Ed. is a Pennsylvania state licensed psychologist, consultant, and international educator based in Pittsburgh, Pennsylvania and Beulah, Colorado. She is the developer of the Comprehensive Resource Model (CRM) and has spent the past 25 years dedicating her work to creating innovative methods for working with dissociative disorders (including medical/somatic dissociation), attachment disorders, and gestational trauma. She is a certified Trauma Model practitioner from the Colin Ross Institute, trained in Robert Schrei’s Sourcepoint Therapy, and practices Usui Reiki. Lisa’s clinical work and teaching provides a combination of psychotherapy, neuroscience, and spirituality in facilitating holistic healing from traumatic events. She is the primary author of “The Comprehensive Resource Model: Effective Techniques for Treating Complex PTSD” (Routledge 2017) with CRM featured as the cover story in Newsweek in April 2017.